Ohh yes I know what you mean. I love snow too. Always have =) Can't imagine being without it at least a Bit in the winter. It's snowing like mad up here right now. But it only dusted us during the day. Now in the AM I will make sure to get some photo's to share with you! Night! 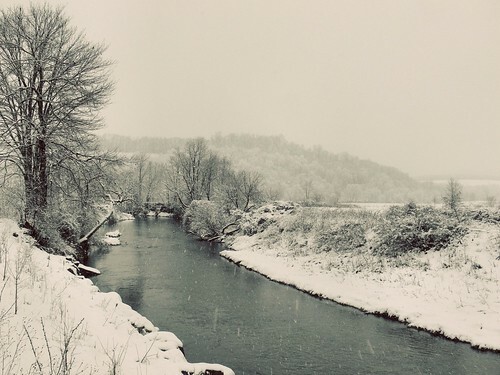 these photos speak of innocence and new beginnings, blanketed in white. What perfect captures of a snow day. It appears that it wasn't a sunny day upon snow, but with a contemplative sky holding the scene. I'm so glad you had a great day like this. The snow days we had here in December are ones I'm still holding close to my heart. How nice would a snow day be? I am looking forward to the cooler weather of autumn and yet we have another waring of extreme fire danger for the next 3 day with conditions the worst since black Saturday. You have really captured the essence of beauty in these shots. 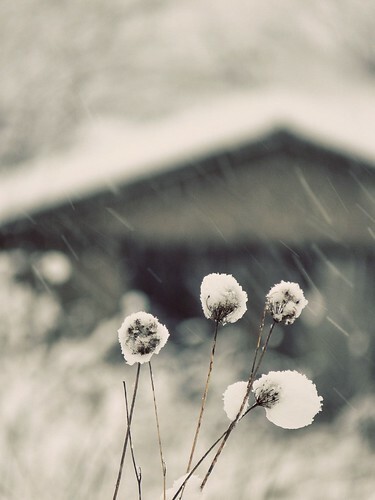 Your shot of the snow on the dried weeds is wonderful. Very artistic. I'm glad you enjoyed your snow. You actually make me like the snow :-) These are stunning pictures!!! I really love the curving road. wow such beauty in these photos and words. I was so happy to see the snow here but it didn't last long and I didn't have anyone to play in it with so that was a bummer. Looks like you two had a blast. makes me somewhat jealous. "light weight" that was fun! Beautiful post & I LOVE that video, you made my day! oh such artistry in these fleeting shots glad you enjoyed it so...I love your laugh lightweight!! It's wonderful when it snows like that... everything is quiet except the snow crystals clicking as they fall. I can't believe no one else was out sledding!! I would have loved it. Beautiful images too! Good eye for composition, J. You totally need to come sledding here in Utah. We have REAL hills here. LOL! beautiful photos. snow, hard for me to get excited about it at this point. it's enough. I love these shots! It looks like a very fun day indeed! Thanks for sharing your snow day with us! I looove your photo treatments! It's like being there... wait - snow here too. Daaamn! LOL - glad you had a lovely time! so beautiful! i hope for some snow soon! Beautiful, frosty images. I can almost feel the snow flakes falling! But looking those picture already give me a chill... must be really cold! Beautiful! I absolutely LOVE these photos. Pure perfection. Looks like you had a WONDERFUL time "playing". Everybody is getting snow but me - thank goodness!! Great snowy shots. this is pure beauty and delicacy all rolled into one! Great shots! What a beautiful picture that snow covered lane, so peaceful looking, thanks for sharing the photos, the poem is also lobely. You've been busy - loved the birdhouse, bee, and family post! Wow! 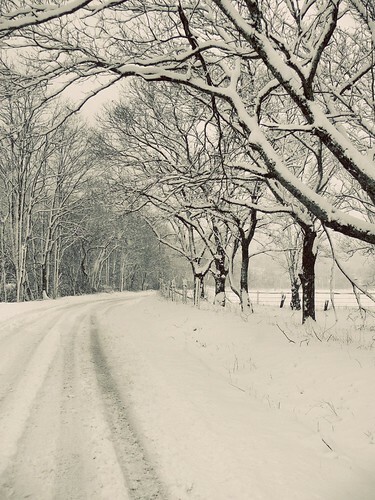 Your snow pictures are breathtaking! I absolutely LOVE these photos. So pure and beautiful. the snow shots... i didn't realize they were part of the happy laughing post. they are so dramatic and wonderful! These pics are all so beautiful but that second photo, stole my heart. the snow pics are awesome, ww. I love these pictures! And even though I'm ready for spring... I kind of miss the fact that I didn't get to see snow this year.